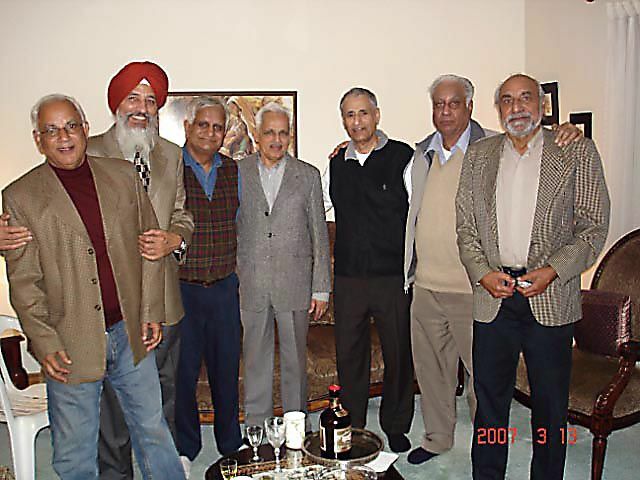 The Sikh Times - Biographies - Gobind Thukral: "Mainstream Indian Press is Controlled by Big Houses"
Gobind Thukral: "Mainstream Indian Press is Controlled by Big Houses"
Gobind Thukral, a veteran journalist from India, was in Halifax, Canada on a private visit. I knew Thukral through his writings in India Today during the turbulence of 1984 and then later in The Hindustan Times and The Tribune. He has spent over three decades in journalism and has received several awards: The Statesman award for Rural Reporting and Panj Pani lifetime achievement award from Doordarshan, India's public television channel. After he retired as bureau chief for The Tribune in 2001, he was a Fellow at the Indian Institute of Advanced Study, Shimla for three years. He agreed to speak with me at my place on March 13, 2007. Jagpal S. Tiwana (J.S.T. ): May we know something about your career? What inspired you to be a journalist? Gobind Thukral (G.T. ): After my post-graduation in English, I started teaching at a college. It was my interest in public affairs and love for writing that took me to journalism. J.S.T. : I have learned that you were appointed a member of the Haryana Public Service Commission by Bansi Lal, but you resigned after a year. Why did you leave that prestigious position? G.T. : There was no particular reason except that the job proved very dull for an active journalist. There was no pressure, political or otherwise, as some may think. The chief minister was extremely friendly and had appreciated Commission's work in the state assembly. I just returned to journalism. J.S.T. : You have launched South Asia Post, a fortnightly journal on Internet. What prompted the decision to start a new journal? G.T. : After spending years in the field of journalism, a thought lingered somewhere in the inner recesses of the mind and always troubled many of us who are involved in launching this Web-based opinion newspaper. It was about something left unstated or not fully stated. Its purpose is not to cast any aspersions, but to state a position. The commercial media of the day by its very nature is more involved in profiteering and self-propagation. It is more about wielding power and less about ideas. Those of us who founded this new journal do not agree that journalism is dead. There are good newspapers both in print and on the Internet just as there are quality radio and television networks. There are meaningful and significant media institutions playing an important role. We salute them. Yet, many of the media institutions, particularly owned by the multinational giants, are no longer true journalistic outlets. Hence these small efforts with the help of friends like you. We strongly believe that a better informed public is the only guarantee for the success of any form of democracy. Journalism committed to dissemination of objective news and opinion plays a significant role. J.S.T. : In India there is corruption in all departments of the government. The media is full of crime stories. What do you think about the future of democracy in India? G.T. : I am not pessimistic as long as people do not give up their rights. Sometimes, even on slight provocation, people take to streets to launch agitations and hold dharnas. Fearless but non-violent protest is of essence and helps the growth of democracy. People in India remain open to be persuaded to start a progressive movement under the right leadership. J.S.T. : Almost all institutions in India are malfunctioning. Is the press perhaps the only institution that is working independently? G.T. : Newspapers are no longer a cottage industry with a printing machine and a few compositors in the backyard. This means heavy investment. Any newspaper, radio or television that has invested huge sums would like handsome returns. For this it must have readers, listeners or viewers. These are needed to attract advertisements and bring in revenues. In a way, newspapers sell readers to advertisers. More importantly, newspapers and other media outlets must have a cozy relationship with the State. There is also a visible tendency towards monopolistic control. Big English papers like The Times of India, The Hindustan Times, and The Indian Express are examples of this. The Hindu is an exception and independent. Many are partisans, promoting party and business interests. The English press, with the exception of The Hindu, is controlled by big houses. The Hindu's name is a misnomer. It is quite secular and independent in its coverage. And among magazines, Outlook and Frontline are more independent than the once very popular India Today. Both are available on Internet. Frontline is brought out by the publishers of The Hindu. J.S.T. : Who are the journalists you like and read? What is your opinion of Khushwant Singh? G.T. : Khushwant Singh writes well. The secret of his success is he does not hide his weaknesses and he is fiercely independent. He does not even spare his friends and admirers. At one time in his career he showed some weakness for Sanjay Gandhi. But then, who is perfect? There was the legendary Sham Lal who passed away last month at the ripe age of 93. He encompassed large areas like politics, literature and art. He was a philosophical editor who ranked as one of the best in the world. A collection of his articles now available in book form is testimony to his impact. There are many others, such as like H. K. Dua of The Tribune, Chaitanya Kalbag of The Hindustan Times and N. Ram of The Hindu. J.S.T. : How do you keep yourself up-to-date? G.T. : Every morning I spend time in reading several newspapers. This is how it begins for most journalists. A cup of tea and a bunch of newspapers. Then I do research and field work; meeting people, politicians; covering meetings and press conferences. J.S.T. : How do you assess Manmohan Singh's performance as India's prime minister? G.T. : He is an honest man. However, his policies are leading to unemployment, rising prices and more sharp divisions among the rich and the poor. An agrarian crisis is haunting the country and he is not able to do anything about it. His model of development may lead to stronger service and I.T. sectors, but other areas are being neglected. J.S.T. : There is a change of government in Punjab. Parkash Singh Badal made some good promises during the elections and is now taking good decisions. What do you think of that? G.T. : I have covered his promises in my article Punjab: Count Your Blessings (South Asia Post). Let us see how many of those promises he fulfils. Out of seventeen positions in his cabinet, five are occupied by his relatives. J.S.T. : He appointed Ajmer Singh Lakhowal, president of the Bhartiya Kisan Union, as president of the Punjab Mandi Board. Do you think this position went to a deserving person? G.T. : Badal has made some good appointments, no doubt about that. His chief secretary, Ramesh Inder Singh, is a capable civil servant. The new D.G.P., N.P.S. Aulakh, is a reputed police officer. Then Darbara Singh Guru, his principal secretary, is an efficient and honest man. And his media advisor, Harcharan Singh Bains, is a smart man and knows his job well. However, I have some reservations about Ajmer Singh Lakhowal. There are many factions among the farmers. If he promotes his men and ignores other groups, that will create difficulties and he is capable of doing so. J.S.T. : The B.J.P. got important portfolios in the ministry. The B.J.P. M.L.A.s are more educated than the Akalis. With 19 M.L.A.s in the assembly, Badal will be controlled by them. What do you think? G.T. : Badal is a cold and shrewd politician and could use a strong B.J.P. to balance his detractors or ambitious men in the Akali Dal. J.S.T. : This election was fought on economic issues. There is no discussion on Hindu-Sikh tensions in Punjab now. Do you think it is a genuine development or a political gimmick to win elections? G.T. : People in Punjab are generally peaceful and wish for speedy economic development in a just manner. They are not communal and only get drawn to communalism by greedy and scheming politicians. J.S.T. : Badal has full control over his party. He does not let any one grow in the party who could be a challenge to him. Do you agree? G.T. : He is grooming his son to succeed him. That is no secret. Sukhbir has been appointed acting president of S.A.D. He is simply waiting to be anointed as chief minister. J.S.T. : S.A.D. is now Sukhbir Akali Dal. Could he be viewed as an acting chief minister? G.T. : Most politicians are promoting their sons and daughters. Nehru and others did so at the national level. In Punjab whether it is Badal or Barnala or Talwandi, they are setting the standard for family rule. Punjab is still a feudal society. A Zialdar's son must be a Zialdar. There are political families just as there are business families. Politics is a big lucrative business. J.S.T. : You write against ministers and politicians and expose their misdeeds. Do they try to harm you in retaliation? G.T. : Luckily no harm has come so far, although protests were a plenty. Once I wrote Akalis Asserting Old Ideological Position (The Tribune, June 14, 2000). In it I stated that in 1977 Badal had called a meeting of like-minded chief ministers but quickly cancelled it when the then prime minister Moraji Desai snubbed him. Later Akalis voted for president's rule in Bihar when in principle they had been against imposition of president's rule in any state. Badal was chief minister in 2000. He read it and phoned me to protest. He was visibly upset but that is all.